← Why “Yeezus” is, yes, a damn good album. I’ve been pretty obsessed with hoodies this season. Mainly because I love them. They are a great garment that is uniquely male. Yes, a woman can wear a hoodie, but guys are more apt to wear the same hoodie every day and have a bond with it. They help us cling to our angst-filled teen years, a time we sort of never out grow. The American Giant Hoodie hit my radar when a friend on Twitter, @Kevindeleon, pointed them out to me. I was impressed with American Giant’s narrative and how they produced their product. I am in need of a new hoodie (wants equal needs), so I ordered one. First off, it’s thick. It’s way thicker than you probably are thinking. They advertise it as a “sweet-shirt,” but it is way thicker than any sweet-shirt you own. It’s not a hoodie you can just toss on and kick around the house it. It’s not cheap. It’s not thin. It’s not disposable. You could easily wear this outside with highs in the 60s or 50s. If you live in a climate where it’s warm more than cold, there’s no point in buying this. You’ll never get much use out of it. That being said, if you do live in a cold environment, like me, then it’s going to be fantastic. From October until March (maybe even April), it is cool to cold here. December and January are especially chilly. This hoodie will be terrific when I just want to leave the house but don’t feel like putting on a thicker coat. It’s pretty stylish, too. It has the “European cut,” which means it has room in the chest, then tappers in the waist. This is a probably for most Americans because most Americans are fat. I’ve lost a few pounds since last year, so the hoodie fit well. There is some room around the belly around. If you’re a big guy, get the extra large. If you’re medium height and build, the large should work. Because of it’s cut, the hoodie will make you look thinner than you actually are, which is a plus. The hood of the hoodie is very large and fits over your head and comes down to about your eyebrows. I like this because it’ll keep you extra warm. You wouldn’t put the hoodie over your head for style points, though. It would look a bit obtuse. You’d mostly put the hoodie up if you’re cold or if it’s raining. My biggest complaint are the sleeves. You can’t pull your sleeves up because the hoodie is too thick. I tend to pull or roll all my sleeves up, so this is a personal preference. I can’t pull my sleeves up with a jacket or coat either, so I’ll have to just get my brain around it. As I said before, this hoodie would be more of a garment you’d wear as protection from the cold than you would to bum around the house in. It’s also impossibly well made. I can’t get over how lush the material is. 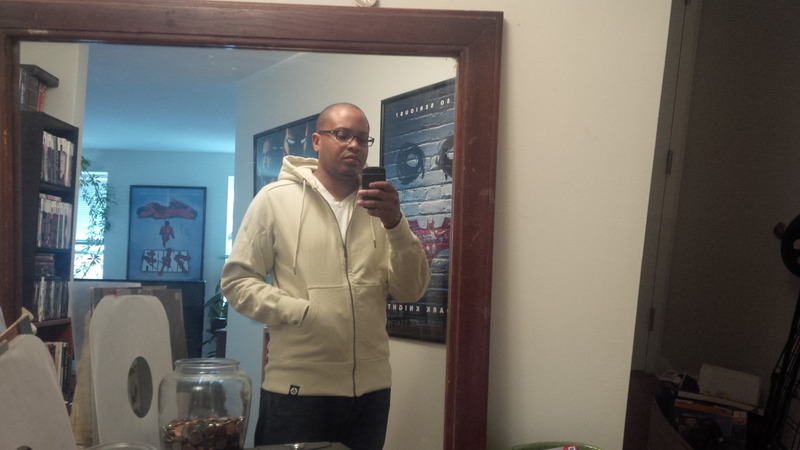 Most hoodies are a cotton/polyester blend, which saves cost. The American Giant Hoodie is 100% cotton. I think we are spoiled by clothes that are made with cheaper materials. When I put it on, it almost felt too rich. It’s what cotton is supposed to feel like, and I’m embarrassed that I was shocked by the quality of it. The zipper is a good, high dollar zipper and all the stitching is top-notch. You’ll have this thing forever. American Giant hoodies are for guys who like wearing hoodies that live in predominantly cooler climates and who have discretionary income to spare. It’s 90 bucks (with free shipping). Now, before you rant and rave, yes, it is worth 90 dollars. It is a great substitute for a fall or spring jacket that is stylish and comfortable. You won’t buy a new one unless you want to. If you look at it in the long term, you’re not spending 90 bucks. You’re probably saving 2 or 3 hundred bucks. Still, the price can sting. The way I see it, my bar tabs can be 90 bucks on a ruckus night and two new video games cost more than that, so it’s pretty easy to justify. Totally subjective hoodie score: 9 out of 10.